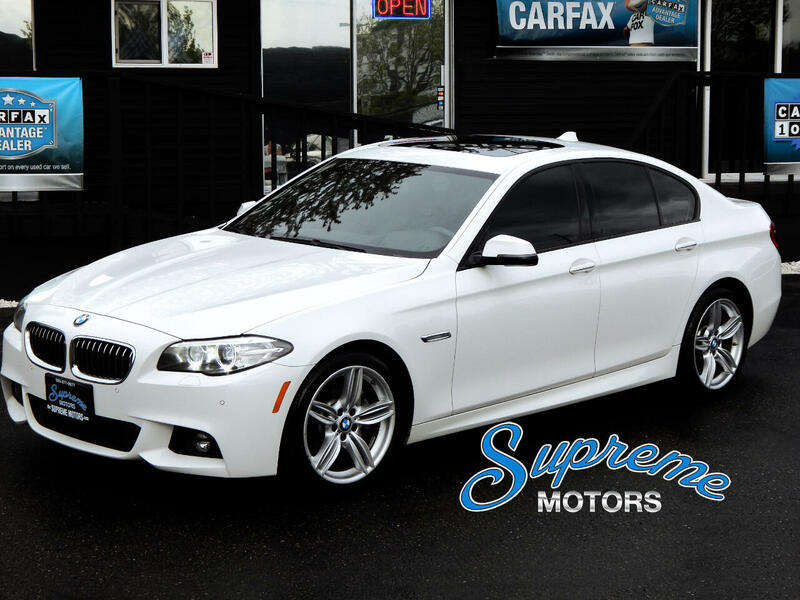 2016 BMW 535I M Sport in the most desired color combination in white on black. The year plays the biggest roll on the value on almost any car. The fact thats its a 2016 makes it still almost new! It still even has some new car scent left! :) You can tell this car was babied, definitely not a smoker, that is for sure! You could have a 2012 535 with 40k miles and it does not drive like new anymore. Father time has never lost so thats why the year of the car you buy is so important. Pieces on cars get old and go out no matter how many miles are on the car. The fact that its a west coast one owner vehicle with no accidents adds huge value. The only person that has owned this car is the one who paid full sticker. That is what we want all of our used car purchases to entail. " ONE Owner." The white on black color combination is huge in most peoples opinions when selecting their BMW. The white just pops and shows all the beautiful body lines this 5 series has to offer. With darker color, the body lines get lost sometimes and they are much harder to maintain. You will get no swirl marks on white like you will on darker paint colors. Silver is the cheapest color in the market by far, as well as tan interior; but remember, if you buy silver you will never "love it" like you would the white one....... AND you will get WAY less on trade for the silver or tan interior, so it actually cost you more to drive the one that was a little cheaper price that you didnt really like. Everything adds or takes away from a value on a car and color combination is one of the biggest factors. This 535i comes equipped with the must have M-Sport Package. If you dont know much about the M-Sport get ready to learn about why its EVERYTHING on any BMW. The M-Sports are way more expensive compared to the regular base or base sport BMW's and will ALWAYS be worth way more than the dime a dozen regular models because of all the upgrades you get and the rarity. The exterior gets a fully redesigned front and rear bumpers that totally change the whole look of the car. Add in the top optioned M Wheels and you get one of the most desirable exteriors in the game. The mixture of sport and luxury is amplified to the max with the M-Sport Package.The M Sport steering wheel is one of the best in the game and is night and day better than any BMW that is not an M Sport.. GAME CHANGER! You wont want to get out of the M-Sport. All of the M logo's on the wheels, steering wheel, and door plates let everyone know this 5 series is special. Also comes with the "must have" heads up display option that helps keep your eyes where they need to be at all times and that is on the road. also has back up camera with park assist, front and rear parking sensors, heated seats,sunroof, bluetooth, all power options, and more. We also offer warranties at exceptional prices so that only adds to the value of buying at Supreme who has 2 owners that do everything. We can sell everything for exactly what it is a little cheaper than the rest. Call or email with any questions or stop by anytime during business hours.